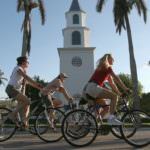 Pure Florida offers a variety of ways to get out and explore Naples via the water. My family and I thought a cruise down the Gordon River sounded like a fun way to see part of Naples that we hadn’t explored before. 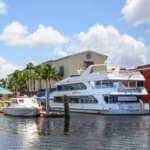 We boarded the 10 a.m. tour on Pure Naples’ boat, The M.V. Double Sunshine. 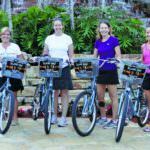 Tours depart five times daily: 10:00 a.m., 12:00 p.m., 4:00 p.m., and 6:30 p.m. We chose the early tour as is was a warm August day and we had an afternoon activity planned. Each narrated tour lasts an hour and a half. The M.V. Double Sunshine can seat a total of 128 people. Since we were cruising in the summer when Naples is a bit quieter, the boat was not crowded which made for a very relaxed atmosphere. The M.V. Double Sunshine has an upper and lower deck, the latter of which is covered entirely while the former is partially shaded. We sat on the upper deck under the cover, which provided nice shade and a glorious breeze. On the main level, beer, wine, water, or soda, as well as snacks, are available for purchase from the Captain’s Bar. Boarding was efficient and easy. 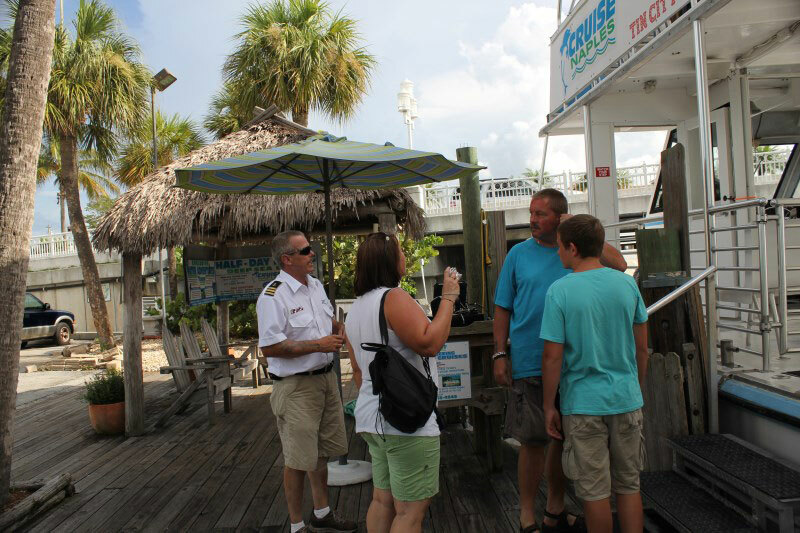 The First Mate Mike and Captain Dale were very friendly and greeted passengers as they boarded. Pure Naples’ M.V. Double Sunshine cruise departed from its dock at Tin City and proceeded down the Gordon River before making its way out into the Gulf of Mexico and the return trip down the Gordon River back to its dock at Tin City. 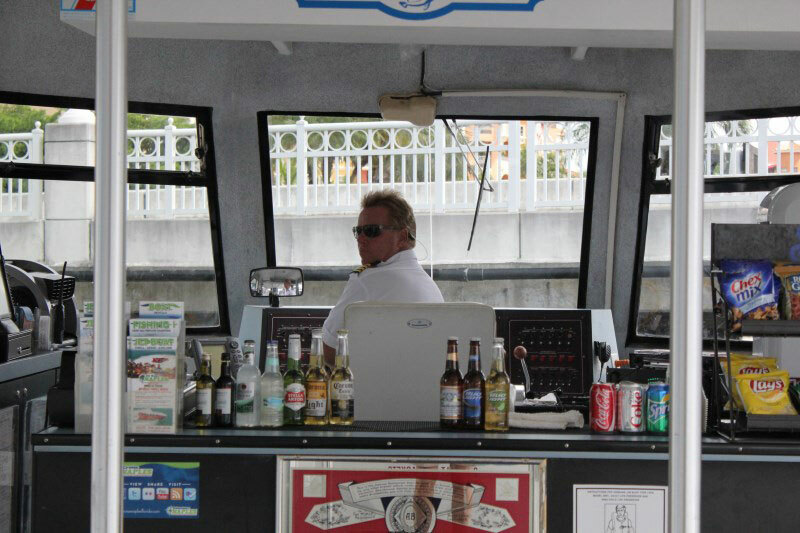 Our knowledgeable Captain Dale began the tour with a brief history of Tin City, Naples Island, and the Gordon River. 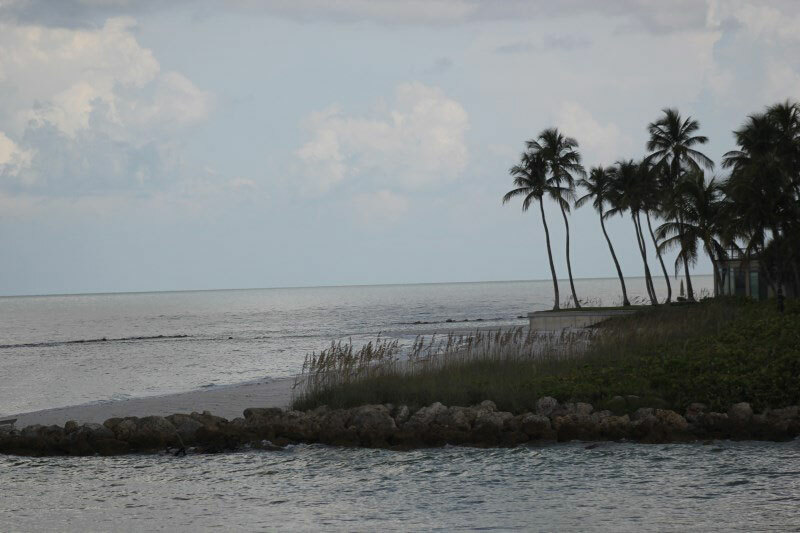 We cruised alongside playful dolphins and admired the beautiful homes and yachts of some of Naples wealthy residents. Our Captain shared with us that 88% of these homes are only occupied 2-4 weeks out of the year, as they are generally 2nd or even 4th homes! We cruised by some of the neighborhood of Port Royal where we saw the spectacular homes of some of Naples’ notable billionaires such as the Collier family (founders of Collier County, the county in which Naples resides), the founder of the Indy 500 Speedway, Goldman-Saks investment bankers, the founder of Anderson Windows, the owners of Mars Candy, and multi-billionaire Jack Donahue who owns 5 homes in the area. 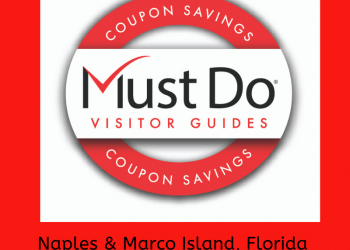 Prior to exiting the Gordon River and cruising out into the Gulf, we cruised past Keewaydin Island, a protected mangrove island with fresh water on land, which supports a variety of Florida wildlife. 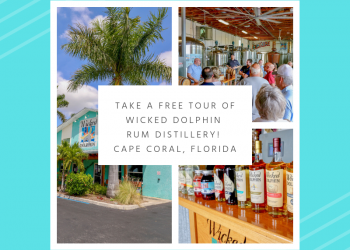 This twelve-mile long island, we learned is home to Florida Black Bear, panthers, deer, Bald eagles, osprey, green sea turtles, manatees, tortoises and a variety of sea birds. The boat poked out into the Gulf, cruised along the shore for a short distance before heading back. 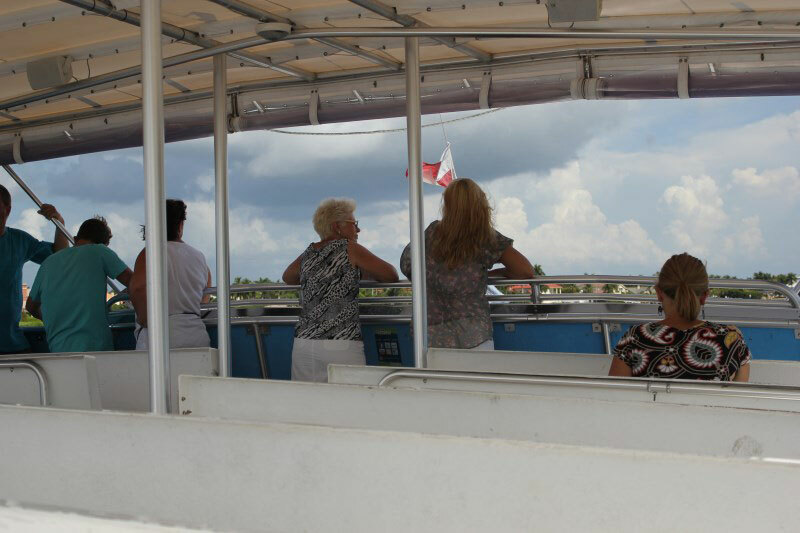 The narrated portion of the tour lasted about an hour and then we leisurely cruised back towards the dock at Tin City for another 30 minutes. 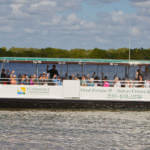 This allowed passengers time to keep an eye out for wildlife – we spotted dolphins, pelicans, and shore birds. Passengers enjoyed refreshments and relaxed while listening to tropical-themed music. 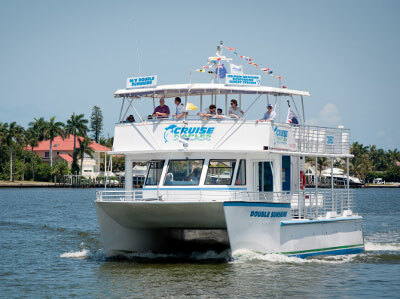 We also passed Pure Florida Jetboat Odin, which was filled with smiling passengers and the Pure Florida Fishing charter boat as we made our way back to the dock. 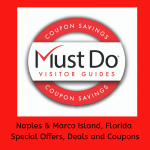 Having never done a tour of the Gordon River we were thrilled to have the opportunity to learn more about Naples history in a fun and relaxed environment – not to mention beautiful. 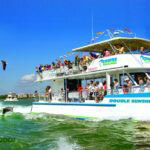 We cant’ wait for an opportunity to go out on a sunset cruise aboard The M.V. Double Sunshine! Pure Florida also offers visitors and residents an opportunity to get out on the water with a boat rental or jet ski rental. Pure Florida is located at 1200 Fifth Avenue So., at Tin City in Naples, Florida.